For best results, remove the cake from the freezer about 10 minutes before serving. 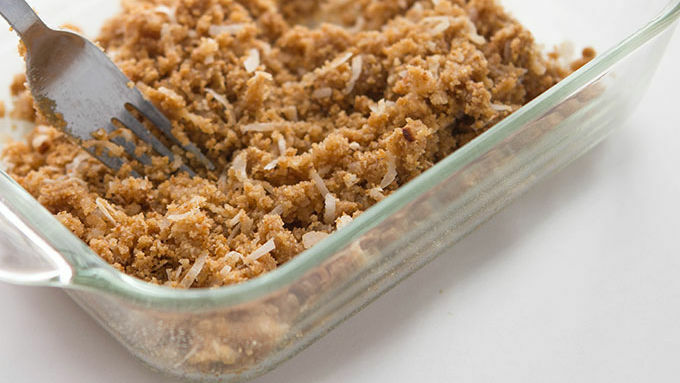 Toasted coconut is mixed into a crunchy, buttery granola bar streusel, then sandwiched around a creamy coconut-pineapple filling. 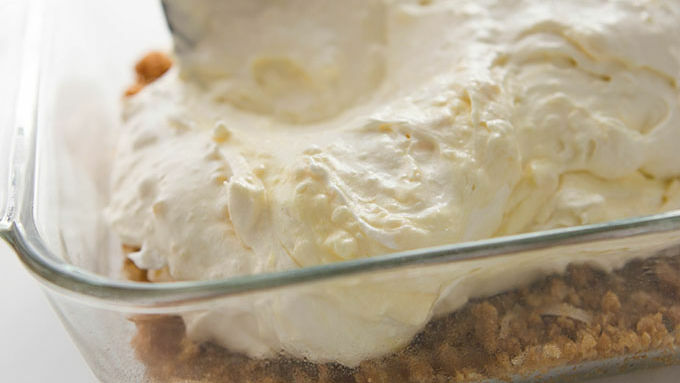 When describing this dessert it’s easy to run out of adjectives. Delicious, heavenly, tempting, tantalizing. Scrumptious. Yummy. Tasty. Mouthwatering. Succulent. Delish. Appealing. Toothsome. I’m not proud to admit I’ve gotten so desperate for new words, I’ve actually used the term “toothsome” before. You guys! Who even does that? Well, me. And I’mma bouts to do it agains. Because THIS.CAKE. It is totally toothsome. 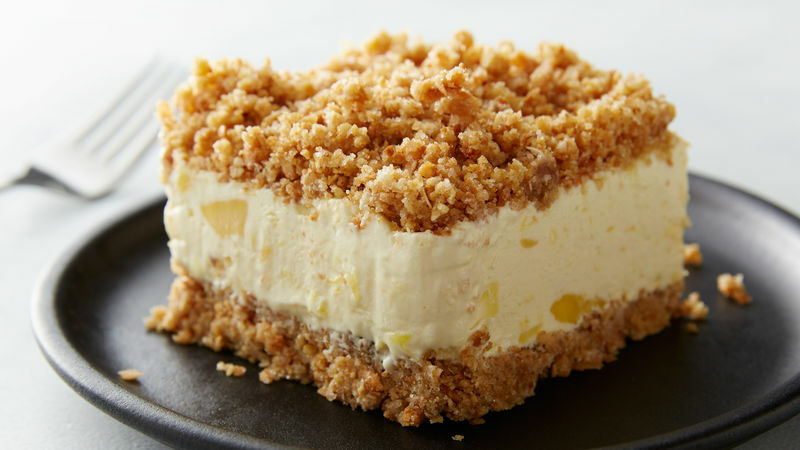 We’ve already brought you several incredible, luscious, irresistible, saporous versions of this insanely delicious frozen crunch cake. But this version. Aye. Undone. 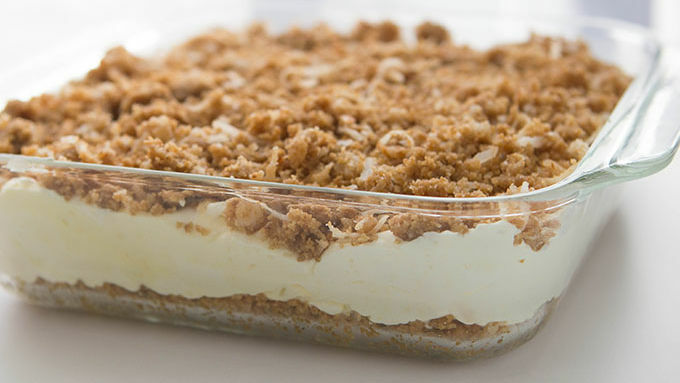 Crunchy streusel. Toasted coconut. 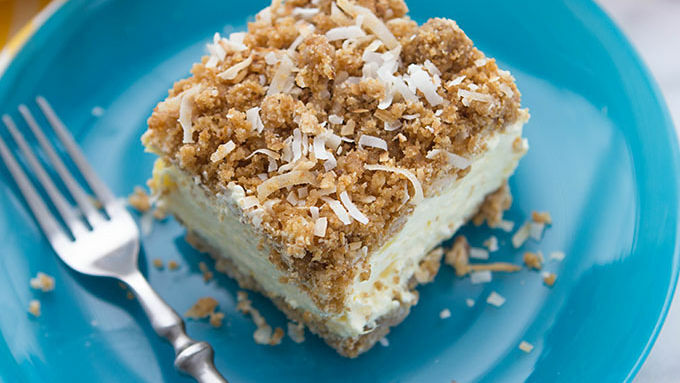 Pineapple bits swirled into a creamy coconut filling. Let’s just call it a day, grab drinks with tiny umbrellas and go sit in the sunshine eating cake. Shall we? It typically takes about 4 hours to get a proper chill on. Be patient. It’s so worth the wait. All frozen now? Okay. Good. Grab a swimsuit. And sunglasses. And probably a Mai Tai, but we’ll sort out the details in just a sec. You’ll also need a fork.